By Xah Lee. Date: 2016-10-04 . Last updated: 2016-10-04 . It uses Cherry MX Blue mechanical switch. 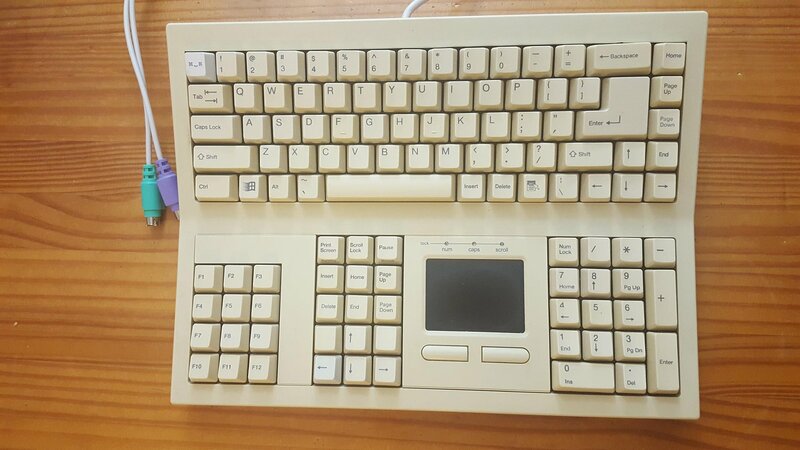 This keyboard, seems interesting, but actually there's no special keys. The function keys F1 to F12 is arranged in a square at bottom left. The Home End Page Up Page Down arrows cluster is at bottom middle. and you have the normal number keypad at bottom right. So, instead of a wide keyboard, it simply rearranged keys to make the whole more square. This design is actually inferior. The function keys, now is harder to hit correctly by touch. Before, when at top, the function keys are distributed in different locations in a line. Your hand can move to any part, with at most 2 neighbor keys you might hit by mistake. Now, all 12 keys are together, each many neighbors, you have to worry about coordination of row and column. The Home End key clusters is now also harder to hit correctly, because they are merged with arrow and Print Screen Pause keys.